What do you look forward to on Christmas morning? I think of cinnamon and plump raisins soaked in rum and bright, cheerful colors. Looks like daring bakers had the same idea. The 2010 December Daring Bakers’ challenge was hosted by Penny of Sweet Sadie’s Baking. She chose to challenge Daring Bakers’ to make Stollen. She adapted a friend’s family recipe and combined it with information from friends, techniques from Peter Reinhart’s book.........and Martha Stewart’s demonstration. All to make a bread that has all the colors and flavors of Christmas. We were even told to shape it like a wreath. Lovely and festive, isn't it! Merry Christmas, everyone and hope you have a great new year. I'd see you after the holidays. Pastry Wars : My quest to find the best version for every basic recipe that should be in a baker's repertoire. When I started, I didn't have a list in mind. But I've realized now that I need to start marking out recipes as I get to my favorites so here's the list I've put together. Tart - work in progress. I am not a regular participant of Indian Cooking Challenge. Though now I wonder why. Every recipe I've cooked for this event has turned out to be a winner. This month's recipe - dum aloo cooked the kashmiri way with a unique combination of spices - was surely the best version of dum aloo I've tasted. An added bonus: it makes your whole house very, very fragrant. I won't write up the whole recipe here because so many others have, so just go over to Srivalli's if you'd like to make some yourself. It may not be perfect, but it's the best cake I've ever made! I had plenty left over from my pineapple pastry so I made a childhood favorite : fruit cream. Chopped up some canned pineapple finely. Also peeled and finely chopped an apple, then plonked it in lemony water for a minute. I added both the fruits to the cream, then added someone syrup from the pineapple can to up the sugar quotient. Mixed it gently and put it in the freezer overnight. Next day, I left it in the fridge for 15 minutes then scooped it out in glasses. Although you can't see it up there, I also topped it with some blackcurrant syrup for a decadent dessert! 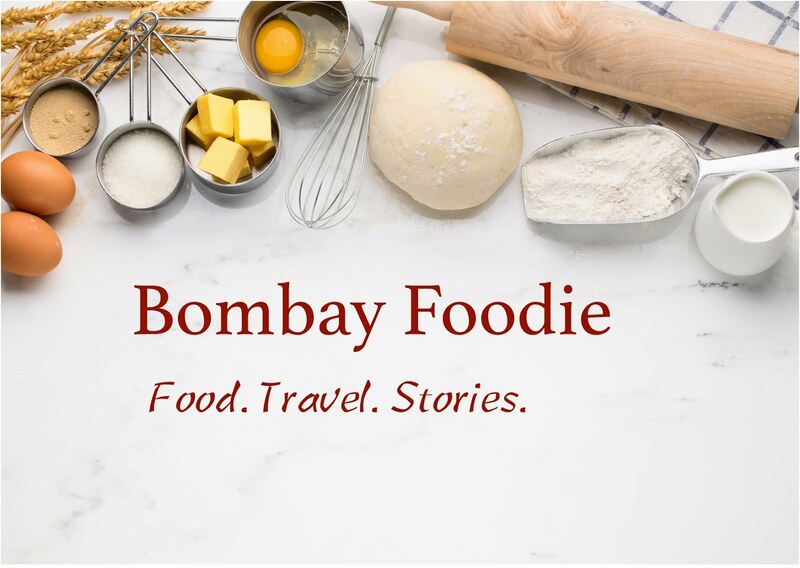 Bombay Foodie was featured in the Super Blogger Series at Simple Indian Food, so you might want to hop on there and read a bit more about me! This is what makes me feel so glad to be a part of the food blogging community. You saw the cake yesterday. I baked it on the morning of my parents' anniversary, hoping to turn into a traditional pineapple pastry they like. Then I panicked. I know that the bakeries use a whipped cream topping, but I also knew that the 25% cream we get in India won't whip. So I put in an SOS mail to Deeba. And she called me back within minutes with ideas to incorporate more fat in the cream. With all her tips and hints, I finally have a pineapple pastry I like. So if you are struggling with 25% Amul cream like me, here's what you do. Tip No. 1 : Get rid of the whey. When you pour out the cream from the carton, you will get thick cream and some whey. Just pour the whey out. Tip No. 2 : Chill, chill, chill. Before you start whipping your cream, put the bowl of cream in the freezer for 10 minutes. I also left the whipping blades of my hand mixer in the freezer for the same time. I've officially given up on sponge cakes. Earlier this week, my parents celebrated their 35th anniversary. And anniversaries call for cake. Or, in case of my family, they call for the pineapple pastries. Of the sort sold at practically every bakery in India. It's essentially sponge cake sandwiched with whipped cream and pineapple, then topped with more whipped cream, pineapple slices and an optional cherry. First step - sponge cake. Except it wasn't. The one I made didn't rise and was too eggy. This is approximately the tenth sponge cake disaster I've had so I think it's time for me to pick another cake as the de facto to-be-iced party cake. Dorie Greenspan doesn't bake sponge cakes, after all. I've tried several of Dorie's cakes and it seemed to me that her French yogurt cake was the perfect fit for the occasion.